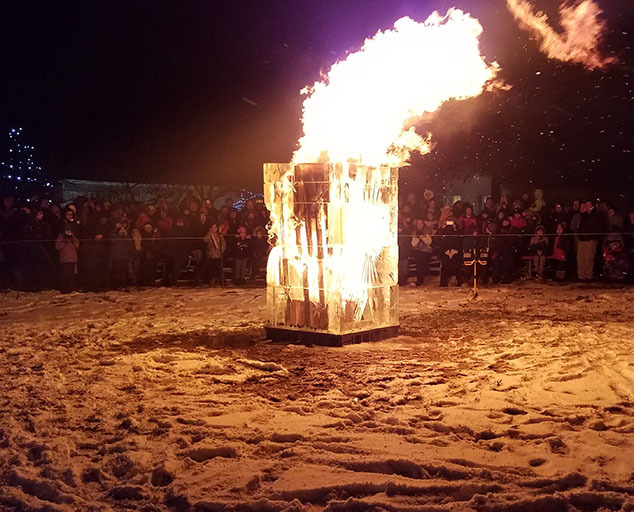 On Friday, January 25 from 5 to 9 pm, the Farmpark Ice Festival will kick off with the unveiling of a Farmpark-themed ice chair and an ice carving demonstration. The night will end with a battle between fire and ice! 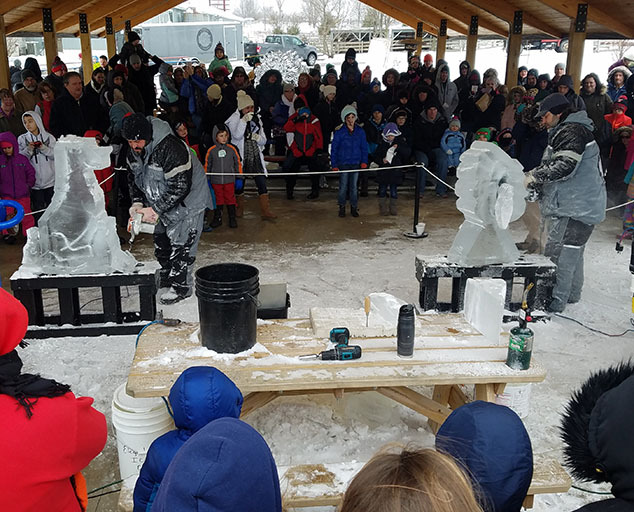 On Saturday, January 26 from 9 am to 5 pm, the best ice carvers from around the country will take part in a speed carving competition. Then, come sit by one of our fire pits and warm up with hot cocoa and s'mores. Enjoy many other winter-themed family activities. All proceeds benefit the the homeless animals of the Humane Society. TICKETS AVAILABLE ONLINE ONLY. TICKETS GO ON SALE NOV. 3, 2017 FOR LAKE COUNTY RESIDENTS AND FARMPARK MEMBERS. IF TICKETS REMAIN, NOV. 4, OPEN SALES BEGIN FOR OUT-OF-COUNTY CUSTOMERS. Click here TO ACCESS THE ORDER TICKETS PAGE. All tickets are sold online only. Due to the high volume of calls and rapid rate of ticket sales in the past, we are no longer able to process phone or walk-in orders. If you do not have access to a computer, we suggest visiting your local library or asking a friend. When purchasing tickets online, Visa Mastercard or Discover are accepted (no cash or checks) and an email address is required. Tickets purchased will be emailed to you. Tickets can be scanned directly from your mobile device at the event or you may print them out and bring them with you. Click here for information about Farmpark memberships. Lake County residents and Farmpark members* have priority access to ticket sales. There is a ticket limit per customer/per Farmpark membership. Country Lights tickets sell very quickly first-come, first-served ONLINE ONLY - securing tickets is not guaranteed to anyone. All tickets sales are final: Lake Metroparks will not issue rainchecks, refunds, or exchanges after purchase has been made, including but not limited to, lost, stolen, damaged or destroyed tickets. Click here to learn how to volunteer at this event and help make memories! Join Ganley Subaru East as we host the annual Lake Humane Society's Santa Paws event! Dress your furry family member up for their picture with Santa! Stop in between the hours of 12-4:30 pm to get the family photos done, and look at all the furry friends dressed to impress with their Christmas sweaters. Please make sure all pets are on leashs and small pets in carriers. Volunteer to be part of the action at Halloween Hayrides. Click here to register as a volunteer. Dress for the weather ─ rides go rain, "shine" or snow! Tickets are required to this sold-out event; please present paper tickets OR your mobile device for barcode scanning. Please remember to arrive no more than 15 minutes prior to your ticket time at Lake Metroparks Farmpark, 8800 Euclid Chardon Rd. (Rt.6), Kirtland Ohio 44094. If attending with a group, please gather together before entering the line. Please be sure to enter the line marked with the time that exactly matches your ticket. Plan to un-board your wagon along the trail to walk through some sites. Those not capable of walking ¼ mile should request to ride a handicap-accessible wagon. The Visitor Center will be open to access restrooms and registration staff. All other animal exhibits and buildings close at 5 pm. This event is SOLD OUT. Tickets are not refundable. Lake Metroparks is not responsible for lost or stolen tickets. In case of extreme weather conditions, follow Lake Metroparks on Facebook or Twitter (@lakemetroparks) for possible event cancellation. Click here for an event map. 3 Weekends of Fall Fun! Lake Metroparks Farmpark continues a tradition of celebrating the harvest season with the Wool Jamboree & Antique Tractor Show! Sheep were shorn of their winter coats in the spring to obtain wool. 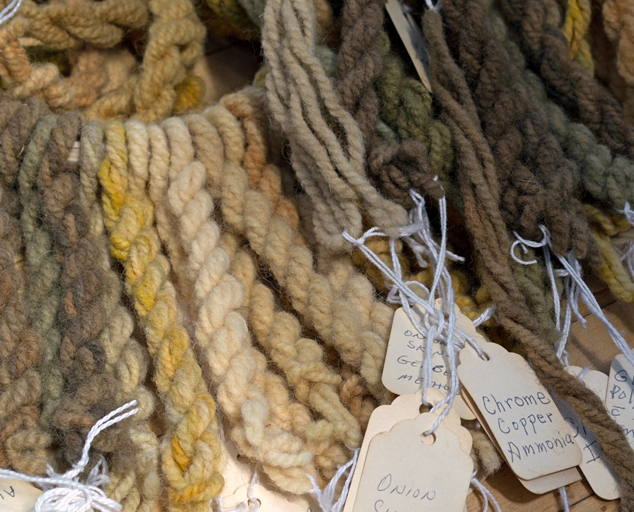 This lustrous fiber is used to make many wonderful products from clothing to blankets. Learn how to spin and weave and make felt. 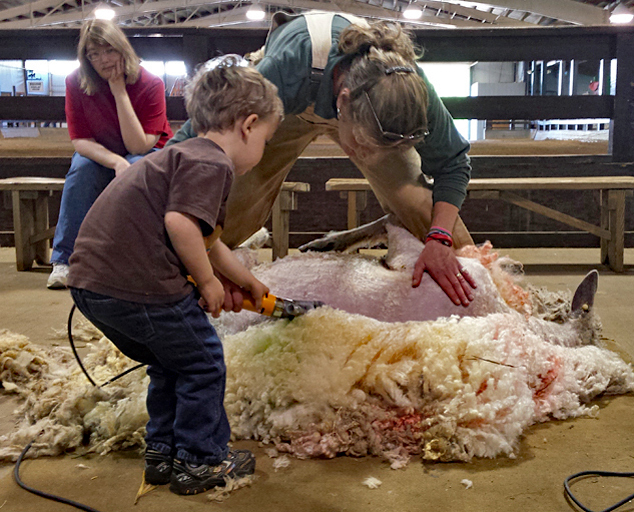 Watch our border collie herd sheep and meet fiber-producing sheep. Tractors have been used throughout the years for use in the harvest. See and hear antique tractors as the tractors parade through the park and talk with their owners about the restoration process. Visitors may also enjoy our Showman's Circle area, including a farm-themed playground and covered shelter for live animal demonstrations. Little farmers can pedal their way on mini tractors through the farm maze on the Pedal Tractor Overlook. They can navigate the hay maze and play in the kid's areas. The whole family can explore the three-acre corn maze. Enjoy harvest-themed crafts and more. Regular Farmpark admission applies. Click here for rates, memberships and directions. Lake Metroparks Farmpark continues a tradition of celebrating the harvest season with a weekend all about apples! 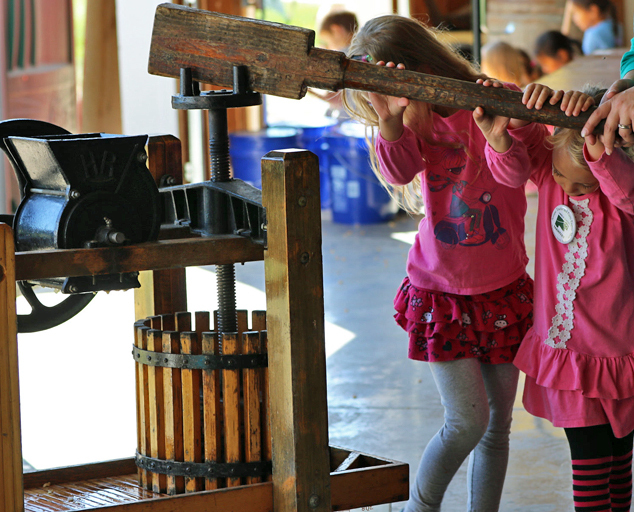 Get a taste of apple cider, sample a variety of apples and help grind apples and press cider. Apple slushies are available at the Apple Cider Bar. 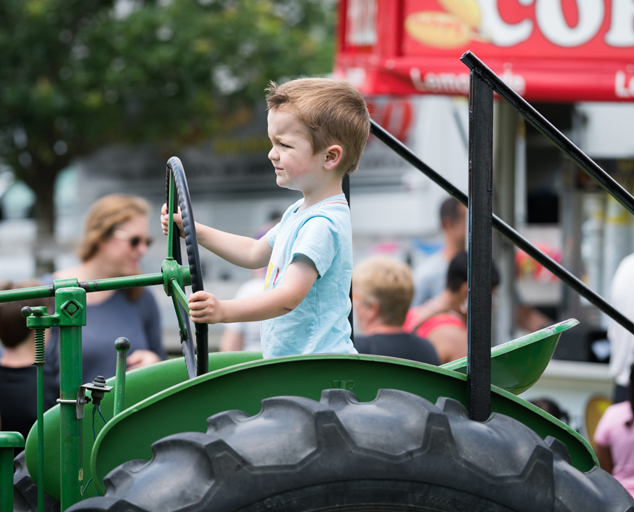 Little farmers can pedal their way on mini tractors through the farm maze on the Pedal Tractor Overlook. They can navigate the hay maze and play in the kids' areas. The whole family can explore the Alien Adventure corn maze. Enjoy harvest-themed crafts and more. 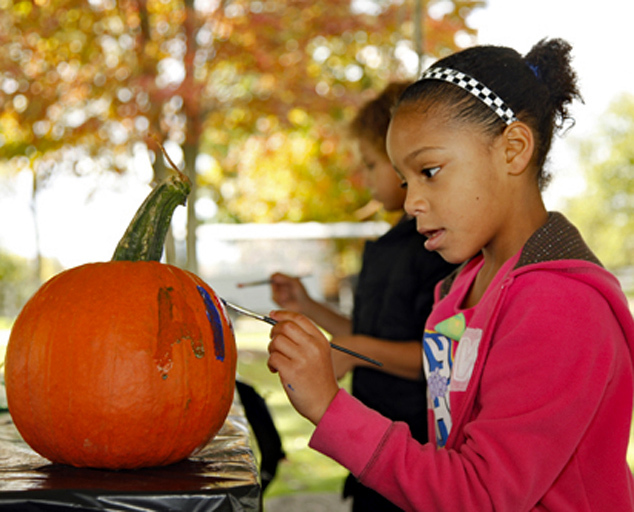 Lake Metroparks Farmpark continues a tradition of celebrating the harvest season with Corn & Pumpkin Festival. Help husk, shell and grind the corn or plow behind draft horses while younger visitors make handmade corn husk dolls and paint pumpkins. On Saturday, Oct. 7, Ohio author David FitzSimmons will share his new children's picture book, Wakem the Rooster: Up All Night through crafts and mini interactive plays. Wakem the Rooster has his days and nights mixed up, and kids can help act out the story with rooster, sheep, cat, dog and owl puppets. Find out if a twist on age-old advice can restore order to the sleep-deprived barnyard. Plays will be held at 9:30, 10:30 and 11:30 am. Enjoy crafts and take-home activities throughout the morning. Mutt Strut is a FREE event for the whole family, including your dog! Enjoy a day filled with fun activities like our mile walk, raffles, dog contests/games, adoptable dogs, agility course, demos, vendors and more! Want to help the homeless animals before Mutt Strut and win some cool prizes? Start fundraising today! Fundraising is simple and helps make a huge impact. Start today by clicking the fundraise button below. The more you raise, the more you win! NEW DATE/LOCATION: Don't forget, Mutt Strut has a new date and location! Join us on SUNDAY, August 27th from 10am-2pm at Lake Metroparks Farmpark! We will also be awarding our Top 5 Adult Fundraisers and Top 5 Youth Fundraisers (Under 18)! The overall Top Fundraiser will be named the ambassaDOG for Mutt Strut 2018 and be the face of the event! 9:00 am- Downward Dog-Yoga with your dog! Register HERE today. Splash Park-Cool off your canine by letting them jump in the pool or bob for bones! ​Paw Print Art-Get your dogs paw print done for a special keepsake! Swim 500 meters in Lake Erie. Depth of water approximately six feet. Wet suits permitted. No flotation devices. Lifeguards on duty. For safety reasons, tired swimmers may stop, touch bottom (if able) and resume swimming when ready. Kayak in Lake Erie. Start on the beach west of the swim course. Paddle north 100 meters, then east parallel to the swim course. Turn around and return to the beach at the same location departed from. Course is approximately two kilometers. Bike 20 kilometers (12.4 miles) out and back on route of paved roads. 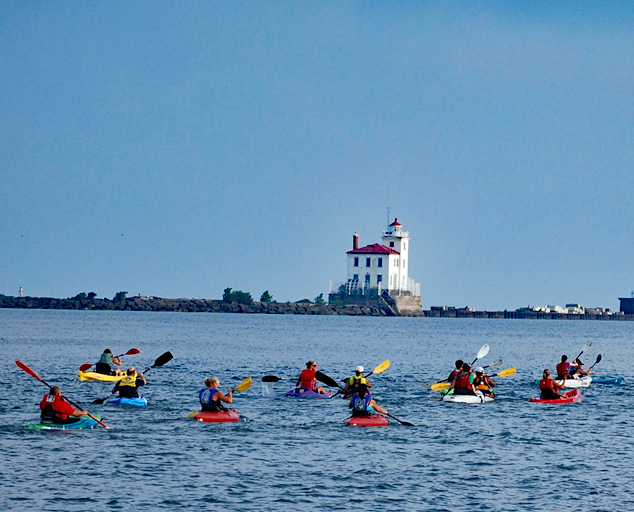 Start at Fairport Harbor Lakefront Park, travel east through Painesville Township and return on same roads. Bicycle helmets required! Route marked with directional arrows on roads. Local law enforcement will attempt to hold traffic at all intersections, however, racers should adhere to traffic laws and race cautiously. There are six railroad crossings; cross with caution. Run 5 kilometers (3.1 miles) on paved roads marked with directional arrows. Run with traffic. Always look both ways when crossing intersections and making turns. Entire course is within Fairport Village limits. Traffic will be controlled at critical intersections. Runners re-enter the beach through East Street access. Last 0.25 mile is not paved, but on hard-packed dirt/sand. 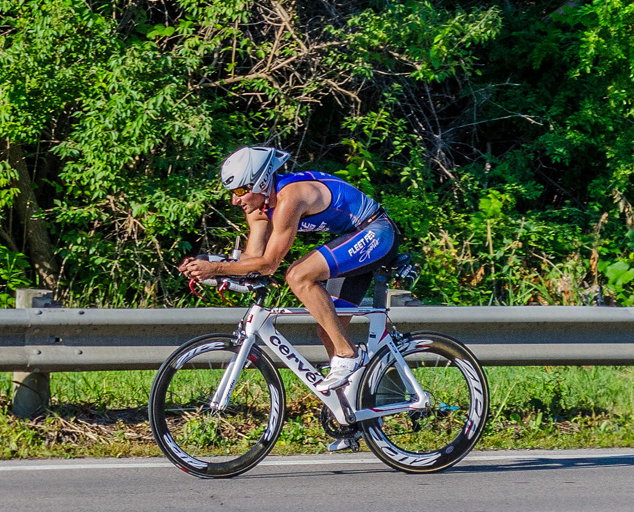 Awards will be presented to the top three finishers of each race category at the completion of the triathlon. Race officials reserve the right to change or alter the racecourse for safety purposes and to alter age categories if insufficient registration is received. Should extreme weather occur, officials reserve the right to cancel the event(s) or delay the start. Cancellations or alterations will be made at 8 am at the picnic shelter at Fairport Harbor Lakefront Park. If sufficient registration is not received by three days prior to event day, Lake Metroparks reserves the right to cancel the race. Entries limited to the first 500 people registered. Sponsored by Ganley Subaru East. July 21, 2018 10 a.m. - 6 p.m. When: July 21, 2018 10 a.m. - 6 p.m. Where: Historic Downtown Willoughby, Ohio The 2018 ArtsFest will be the 27th anniversary and will feature 130+ juried artists, music, and food. This show welcomes approximately 15,000 people! Willoughby ArtsFest - you won't want to miss it! Contact the Willoughby Western Lake County Chamber of Commerce with any questions about this great event! Call our office at 440-942-1632, visit our website website: www.willoughbyartsfest.com, or e-mail: info@wwlcchamber.com. Artists can apply for booth space prior to May 31, 2018. Details can be found on the Willoughby ArtsFest website. A variety of sponsorship opportunities exist as well! A great opportunity to increase your business' exposure in the community. Contact our office for more details, 440-942-1632. 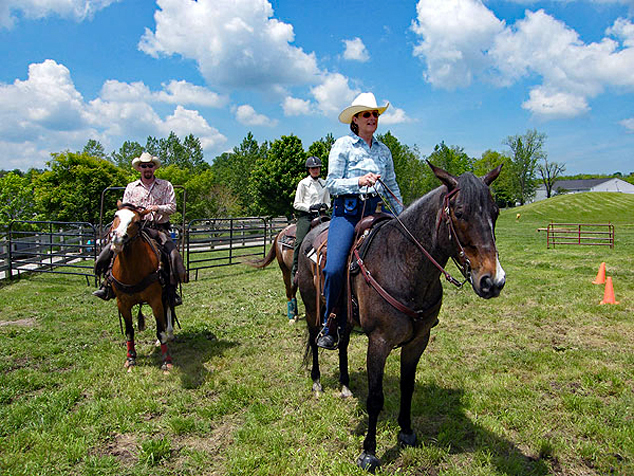 Lake Metroparks Farmpark hosts FarmFest: Ribs, Brew & Music on July 13 & 14. This year's event has been expanded and features more music, kids' activities, craft vendors and food vendors serving BBQ and ribs. Wine from Chalet Debonne and beer from Double Wing Brewery available for purchase (5 to 8:30 pm on Friday and noon to 8:30 pm on Saturday). Admission to the park and event is FREE. Pony rides, food and beverages available for purchase. Rock, Jam Bands, Latin, Soul, Bluegrass and more! The Party in the Park is not just for the music lover. During the 3-day event there is a wide array of things to do for adults and children of all ages. The Community Stage features many different activities, demonstrations, music and many other things for the whole family to enjoy. Also, in the Community Stage area is the PPITP "Family Fun Zone" with large inflatables for the kids to enjoy. Lake Metroparks will host the summer Regional Senior Games. 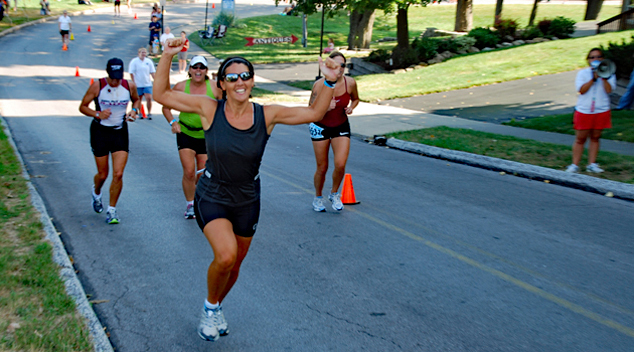 These great events are geared for both athletic competition and social opportunities. Competition groups are divided into five-year categories beginning at age 50. Take a mini vacation to Penitentiary Glen for two nights of outdoor family camping fun. 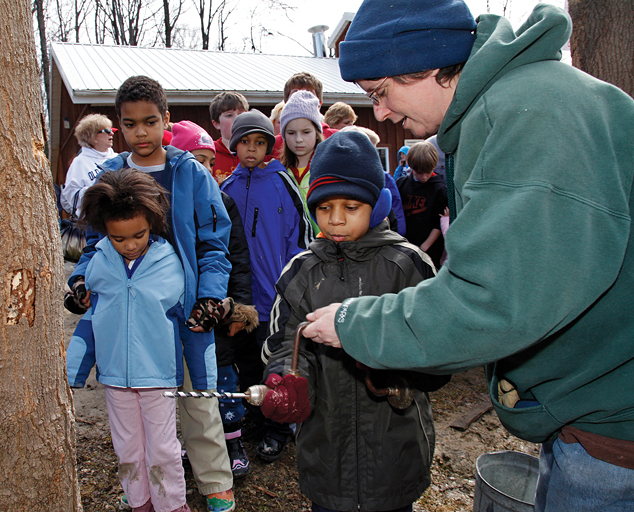 Enjoy nature programs, hikes, campfires, s'mores, storytelling and more. No electrical or water hookups. Who: Wine Lovers and Animal Lovers Alike! When: Saturday, June 16, 2018 from 1:00-5:00 p.m.
Why: To enjoy a beautiful day at the vineyard to help save lives! All of the proceeds from the event benefit the animals of Lake Humane Society. For more information on this event, please contact our Events Coordinator. We hope to see you there! Have a howling good time and meet many breeds of dogs, talk to handlers and trainers and find out what dog is right for you. See demonstrations by Lake County police K-9 units, Ohio Disc Dogs, Hampton Hills Newfoundlands and discover the many sports and activities you can enjoy with your four-legged friend. Due to the nature of this event and facility, please do not bring your pets. We are proud to be a sponsor for such a great cause! Good Day, Hikers and Bikers! 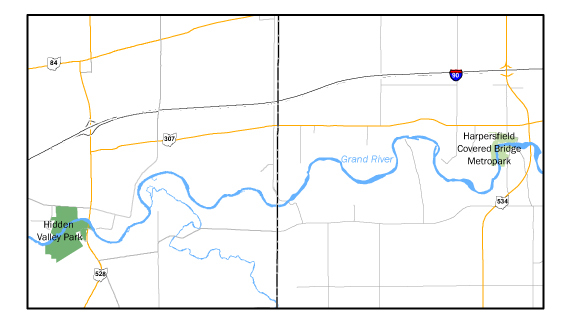 The 2nd Annual Bike and Hike for MS will be a recreational ride around the scenic Grand River Valley Region. There will be three options for rides, at varying difficulties, traveling around Lake and Ashtabula County. Riders will catch a covered bridge or two and of course pass a few wineries along the way. Hikers will enjoy a 3k hike through the vineyards and woods of Debonne Vineyards, Ohio's largest estate winery and the home of Double Wing Brewing Company. All pre-registerd bikers and hikers will receive an event t-shirt and lunch when they return to the brewery. Live entertainment will also be provided by Horsefeathers upon your return. Plan to spend a relaxing afternoon helping a great cause. 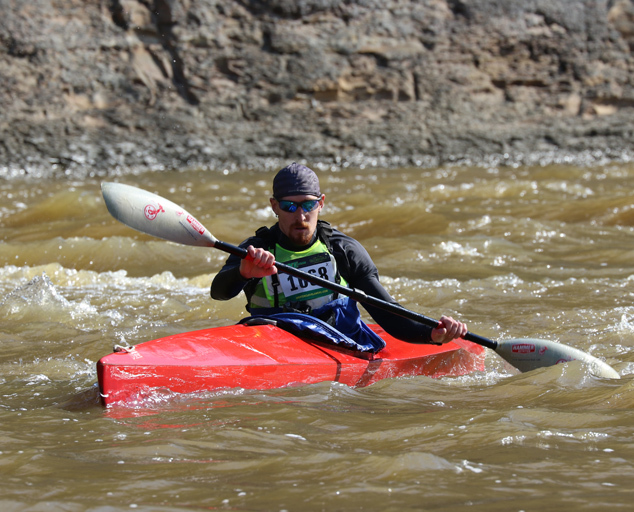 An annual springtime tradition; experience an 8½-mile canoe and kayak race from the Harpersfield Dam (Ashtabula County) to Hidden Valley Park south entrance (Madison) on the wild and scenic Grand River. Features a "maddest hat" contest. Awards to top three finishers in each race category (determined by skill level and boat type). We are all responsible for caring for our natural environment. This has been the concept of Earth Day since its beginning in 1970. Lake Metroparks continues that focus to celebrate the Earth and make a commitment to learn and use new ways to make our planet a healthier place. Discover simple and fun interactive themed activities, games, eco-friendly crafts and demonstrations. Take a walk along the trail. Take a tree sapling home. (1 per family). 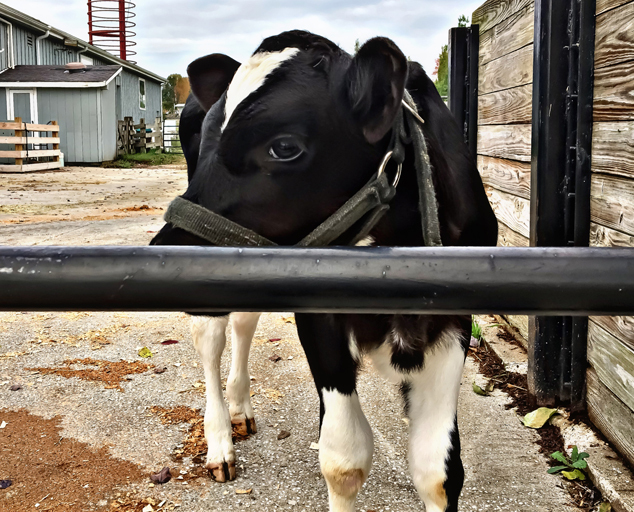 See farm animals from Farmpark. Listen to live music and hear stories told by Mother Nature. Get trimmed at the Haircut-a-thon presented by Ladies & Gentleman Salon & Spa. Ride the miniature trains provided by the Lake Shore Live Steamers between 1 and 3 pm, weather permitting. Browse our selection of unique gift items in The Nature Store. Pop, popcorn and other snacks available for purchase. Find out what local conservation-focused organizations and agencies are doing, and how we can do our part, to protect and clean the air we breathe at the Eco-Fair. Browse locally made and eco-friendly merchandise for purchase at the Earth Day Marketplace. Come join Ganley Subaru East as we proudly sponsor the Lake Humane Society's Rescue Rock Off. Bring your friends and family for a Sunday Funday filled with live local music, food, drinks, prizes, and giveaways! The fun starts at 12:00 and goes to 5:00 pm. Lets pack the Willoughby Brewing Company and help support our friends at The Lake Humane Society! In January we helped sponsor Lake Farmparks second annual Ice Festival featuring a Subaru Dog & Eskimo! TICKETS AVAILABLE ONLINE ONLY. TICKETS GO ON SALE NOV. 1, 2017 FOR LAKE COUNTY RESIDENTS AND FARMPARK MEMBERS. IF TICKETS REMAIN 8 AM NOV. 2, OPEN SALES BEGIN FOR OUT-OF-COUNTY CUSTOMERS. Click here TO ACCESS THE ORDER TICKETS PAGE. · Dress for the weather ─ rides go rain, "shine" or snow! · Tickets are required to this sold-out event; please present paper tickets OR your mobile device for barcode scanning. 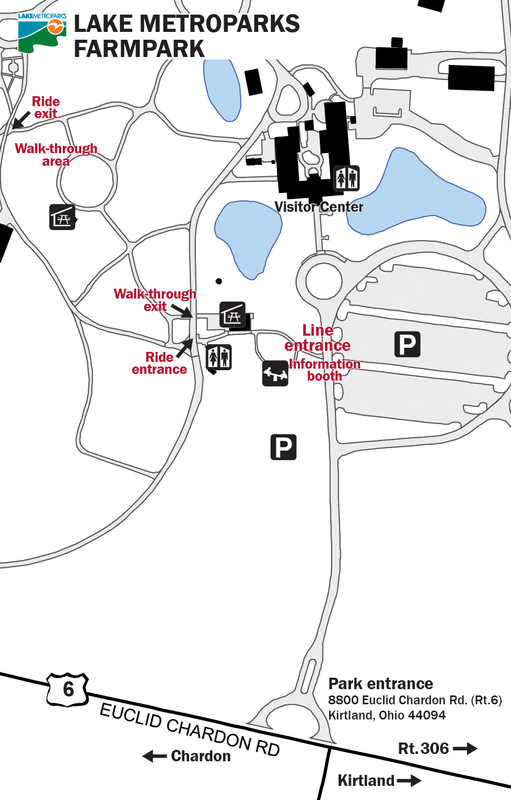 · Kindly arrive no more than 15 minutes prior to your ticket time at Lake Metroparks Farmpark, 8800 Euclid Chardon Rd. (Rt.6), Kirtland Ohio 44094. · If attending with a group, please gather together before entering the line. · Please be sure to enter the line marked with the time that exactly matches your ticket. · There are approximately 500 tickets sold for each time slot. Expect to wait in line while wagons are loaded. Enjoy the entertainment that is provided while you wait; it is part of the experience! · Plan to un-board your wagon along the trail to walk through some sites. Those not capable of walking ¼ mile should request to ride a handicap-accessible wagon. · Snacks and drinks will be available for purchase. · The Visitor Center will be open to access restrooms and registration staff. All other animal exhibits and buildings close at 5 pm. Join us for our annual Adoption Event as part of our #SubaruLovesPets featuring adoptable puppies, dogs and kittens from Lake Humane Society! Last year we were able to adopt out 27 animals to their furever homes - let's do even better this year. -Bring Donations from Lake Humane Society's Amazon Wishlist to help us Stuff the Subaru - each donor will receive a Subaru squeaky toy and a Subaru Loves Pets bandanna! This event will be held in our showroom at Ganley Subaru East in Wickliffe. Come see us at 28840 Euclid Ave, Wickliffe OH 44092 between the hours of 1pm - 3pm. The first 5 RSVPs get a Poler Reversible Napsack, a Topo Designs Duffel Bag, a Leatherman Wingman survival knife, a Klean Kanteen mug w/Café Cap and a Kuju Coffee Pocket PourOver. AND anyone who test drives the new car will receive a $250 voucher off the purchase of any new car! Advance ticket sales are now closed for our Nature's Brew Beer Tasting. If you purchased tickets, please check in at the registration table when you arrive and then enjoy great beer, a live band, and beautiful blooms amid the late-summer beauty of the Holden Arboretum. Sample a wide range of craft brews while enjoying live music from the Gage Brothers, playing backyard games, and watching night fall and the stars come out. Participating breweries include: Ayinger Brewery, Blake's Hard Cider Co., Great Lakes Brewing Co., Lindemans Brewery, Orval Trappist Brewery, Royal Docks Brewing Co., Sam Smith Brewery and Thirsty Dog Brewing Co. Prefer a wine? Join us on June 2, 2018 for our Bouquets Wine Tasting. Must be 21 or older to attend. Registration ended Sept. 13. Advance registration is required. Who: LHS Supporters who would like to help! What: Our Annual Pledge Walk & Day of fun! When: Sunday, August 27, 2017 from 10:00 a.m. - 2:00 p.m.
Why: To enjoy a day of fun in the sun while helping the homeless animals at LHS! How: Raise pledges for the animals in need and join us at the event! Mutt Strut is our annual pledge walk we host each summer. After raising pledges for the homeless animals in our care, our proud supporters enjoy a very eventful day with an itinerary full of fun activities. Some of these activities include: the one-mile walk, canine games and contests, prize raffles, an agility course and rally training course provided by our friends at PetWorks, a Chinese Auction, food available for purchase, "Project Ruffway" a runway show of adoptable dogs at LHS, informational booths about LHS, face painting and crafts for children, shopping at the Mutt Mall which includes a bunch of vendors who support our cause and so much more! Help make a difference in the lives of the animals at Lake Humane Society. It's so simple, yet means so much! Create an online fundraising page of your own on FirstGiving and raise pledges by sharing your page with your friends, family and co-workers. To create your page, click here then click the green "Fundraise" button. You can personalize your page and make it your own! To collect donations, share your page via e-mail, Facebook, Twitter, etc. Please help us reach our goal. We cannot do it without you! For step-by-step instructions on how to create your fundraising page, please click here. If you prefer raising money the old-fashioned way, that works, too! Stay tuned for our downloadable pledge form. You won't want to miss our 2nd Annual Car Cruise & Dyno Meet at Ganley Subaru East, 28840 Euclid Ave. in Wickliffe, OH! Registration will take place between 9:00AM and 11:00AM. First, Second & Third Place get Trophies! Plus, special guest UFC World Heavyweight Champion Stipe Miocic will be there once again to give out Stipe's Choice Award to the vehicle of his choosing! For more information visit: parkpartyinfo.com! PHOTOS TO COME! Ganley Subaru East in Wickliffe and the Wickliffe Forever Foundation presented Rock the Mansion, a FREE concert celebrating Wickliffe's Bicentennial! Featuring E5C4P3 the Journey Tribute, and opening act Erin Burke! Check out the band at escapethejourneytribute.com! Delicious multi-cuisine food & refreshments were available to purchase from Tony's Truckstop Food Truck! Guests were invited to grab a blanket and enjoy E5C4P3 and the magical sounds of Journey free on the front lawn of Coulby Mansion! Lake Metroparks Farmpark hosted Farmfest 2017: Ribs, Brew & Music on July 7 & 8. This year's event featured more live music, kids' activities, craft vendors, food vendors serving BBQ and ribs, wine from Chalet Debonne and beer from Double Wing Brewery. Admission is FREE. Friday's activities took place from 5 to 9 pm. Guests could bring a picnic dinner or purchase a meal from one of the BBQ vendors. Kids enjoyed the barrel train, pedal tractor, fishing, Ohio Disc Dogs and the Touch a Tractor area. Everyone enjoyed the sounds of the Back Traxx Band. Saturday's activities took place from 9 am to 9 pm. The morning kicked off with the first annual "Farmpark Chicken Run" and costume contest. Guests enjoyed the music of the Chardon Polka Band while fishing or running through the farm-themed obstacle course. Guests watched wildlife presentations highlighting animals from Lake Metroparks' Kevin P. Clinton Wildlife Center and a competition featuring the Ohio Disc Dogs. All of Farmpark's regular activities will also be available. The night was capped off he night with a performance by Sumrada. 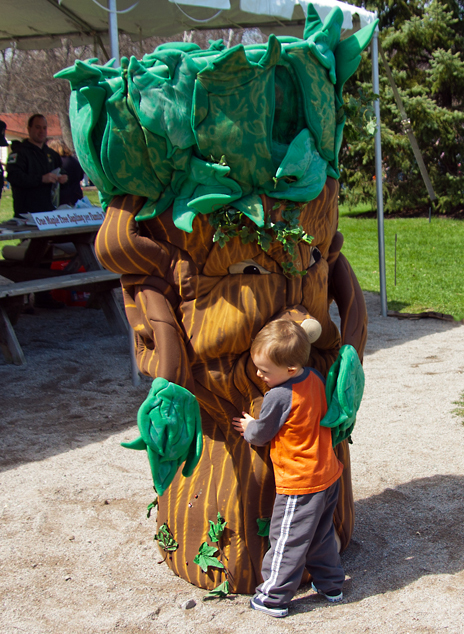 Family camping fun, nature programs, hikes, campfires, s'mores, storytelling and more! We had an amazing time sponsoring this event! Have a howling good time and meet many breeds of dogs, talk to handlers and trainers and find out what dog is right for you. See demonstrations by Lake County police K-9 units, Skyhoundz Disc Dogs, Hampton Hills Newfoundlands and discover the many sports and activities you can enjoy with your four-legged friend. Check out our photos from this event below! When: Saturday, June 17, 2017 from 1:00-5:00 p.m. Admission is $20 in advance and $25 the day of at the door. Admission includes entry into the event and a Muddy Paws wine sampling (for adults 21 and over). $1 from EVERY bottle and 25¢ from every glass of wine sold at the event benefits our shelter. Food is available for purchase and can be enjoyed outside on the lawn (weather permitting). No outside food or beverage is permitted. Ticket sales coming soon! All of the proceeds from the event benefit the animals of Lake Humane Society. For more information on this event, please contact our Events Coordinator. This year's featured performer is Ashley Pletcher of Keystone Equine Entertainment & Training LLC in Winston Salem, North Carolina. 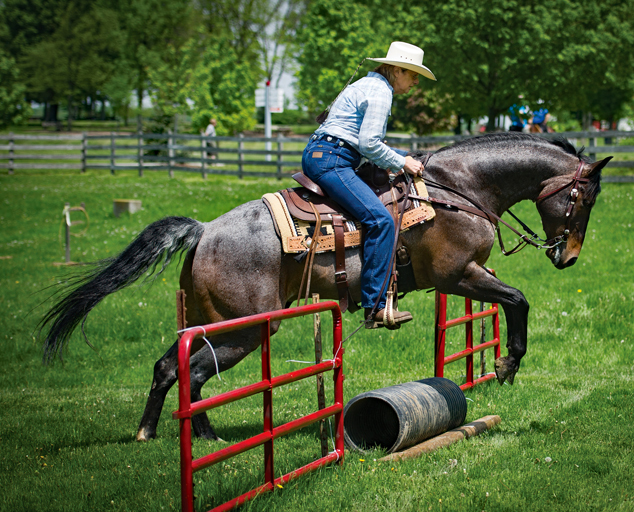 Ashley and her horses Magua, Dakota and Axle enjoy entertaining across the United States with their Roman riding, trick riding and trick horse acts. 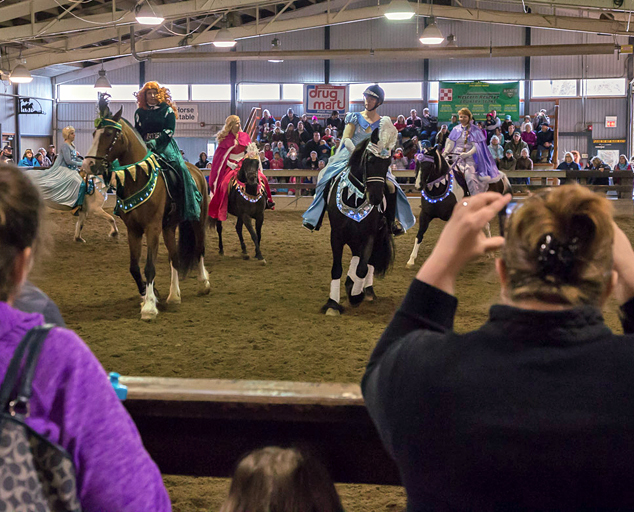 They also offer instruction in trick riding, Roman riding, trick training and liberty work in clinics and at their homebase in North Carolina. Click here to visit their website. Ganley Subaru East was proud to partner with Subaru of America, Inc. as part of our 2017 Share The Love Event. From November 17th 2016 through January 3rd 2017, members of our community who purchased a new Subaru were able to direct a $250 donation from Subaru of America to the charity of their choice - ASPCA, Make-a-Wish, Meals on Wheels, The National Park Foundation, or our local charity - Birthright Lake County. Birthright Lake County offers free, non-judgemental, confidential help and guidance to pregnant women and families who are struggling due to personal and/or financial difficulties. Birthright offers services such as counseling, pregnancy testing, maternity clothing, infant and toddler clothing, formula, diapers and baby food. It was through the generosity of our customers and Subaru of America that we were able to donate a check for $56,100 to Birthright Lake County!! This provided much-needed funding for this organization - especially since they are in the middle of an unexpected relocation. This donation will help ensure a smooth transition and help Birthright continue to provide the excellent level of care and support to families who need it the most. We were proud to support Lake Humane Society for their 7th Annual Rescue Rock Off on Sunday, March 12th at Willoughby Brewing Company located in Downtown Willoughby. Rescue Rock Off is a fundraiser, which features five live performances by local bands who are donating their time for the cause. The event also includes: delicious food, an Auction with an assortment of amazing prizes, a 50/50 Raffle with 2 chances to win hundreds of dollars, door prizes and much more! at the Great Lakes Mall! We were proud to support our community for the 2017 Home & Lifestyle Expo at the Great Lakes Mall! We had a booth located just inside the Food Court and a new 2017 Subaru Impreza on display. Attendees had the opportunity to learn more about our store, the Subaru brand, and entered to win a free oil change or free complete detail! Thank you to our amazing customers who came to our 2017 Subaru Impreza Launch Party at Ganley Subaru East in Wickliffe on Saturday, February 18th, 2017! We had a great lunch, learned about the new Imprezas and demonstrated Subaru Eyesight's intelligent car-stopping technology on the newly designed, state-of-the-art 2017 Subaru Imprezas. Customers also received a $250 voucher good off your lowest quoted price on a new Subaru! Lake Metroparks 2016 Subaru Ice Festival Featuring a Life Size Subaru Outback Ice Sculpture! 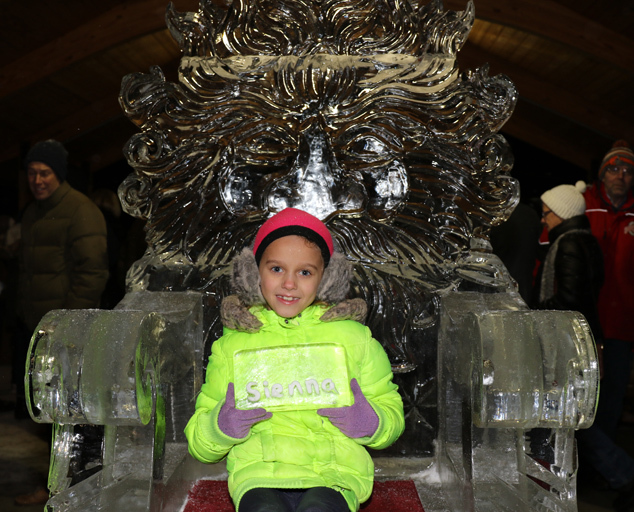 In January we helped sponsor Lake Farmparks first ever Ice Festival. We were pleased to be invited to help with such an amazing event. We donated 6 Blocks of ice to be carved into an almost life size Subaru Outback in which the children were able to sit and take photos! Santa came to town, or to the Subaru Dealership! In December we donated our showroom to our friends at the Lake Humane Society for their annual Santa Paws event. Ganley Subaru East was proud to help sponsor this year's NEOCycle Event supporting Sustainable Cleveland, an organization dedicated to a 10-year initiative aimed to bring people together to develop a community of people to reshape Cleveland into a vibrant livable city with a flourishing natural environment, and to be a resource to help people make smart, sustainable choices at home, work and in the community. On Sunday September 4th 2016 we hosted our first ever car show! We had a fantastic turn out with over 150 participants from all over Lake and Cuyahoga Counties. The event featured UFC Champion Stipe Miocic as the judge. We look forward to hosting an even larger event in the summer and fall of 2017!